Now an again I find a fun video I like so I put it on this blog just for fun. This is how I felt when I saw Super Cat Jumps out of a Large Box in Slow Motion. It made me smile and I think it will do the same for you. Meet Maru, a beautiful cat that enjoys having lots of entertaining fun. Cats are such mysterious pets. Their brain is always working to be more creative than they were yesterday. This video gets better as it moves on toward the end. Watch for the two feet in the side hole and the bit of drama that follows. I wonder if Maru knows he is a real celebrity. Again, here is Super Cat Maru, just for fun. Here’s more of Maru. It’s easy to tell that someone certainly loves this beautiful cat. Take good care of that super cat you have and if you think he or she might appreciate it, bring home a box for them too. If you don’t want a box around the house then take a look at cat condos and trees. Such fun for sure. 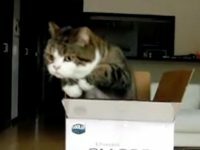 Find more Maru videos for your enjoyment. Thanks for visiting and taking a look at Super Cat Jumps out of a Large Box in Slow Motion. I hope you enjoyed it. I must say, that cat was esp. cute because of it’s round, flat face. Looks like an exotic shorthair or similar. Too cute! Hi Morgan Cat, Yes Maru is quite the cat. He seems to be having quite the fun life. He has tons of videos on YouTube too. Lots of fun watching him. Thanks for your comment. That Maru cat is so cute.